Conductors used for taping lines have traditionally been annealed in bell furnaces. Batch annealing can result in uneven recrystallization and surface quality issues like sticking of flat products. Batch annealing is followed by wet and/or mechanical surface cleaning before the conductor is fed into the taping line. 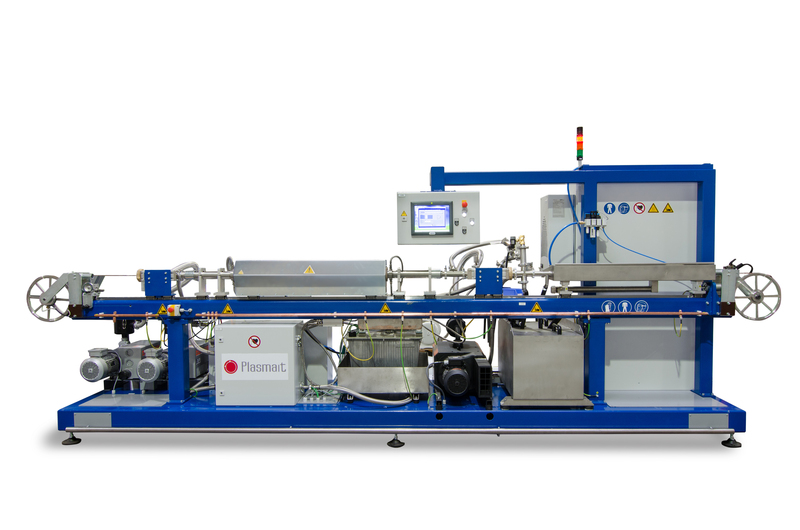 To address shortcomings of the batch annealing process Plasmait GmbH introduced a new PlasmaANNEALER that was designed to anneal and clean round or rectangular conductors in-line with a conventional taping line. The new plasma annealing approach has been favoured in a taping line as it brings about improved accuracy of conductor mechanical properties and above all better surface finish resulting in superior tape adhesion. The new annealer comes in three alternative sizes depending on required output and can cover a wide cross-section range up to 0.18 inch2 (120mm2). Rapid plasma heating and with reduced time of recrystallization results in fine grain size and accurate yield strength values that can go all the way down to super-soft levels if necessary. The PlasmaANNEALER can cold start production in few minutes and can be stopped imminently allowing for high utilisation of the taping line. The new annealer has been designed in a horizontal configuration, which allows easy handling. Yet, vertically configured lines can be offered to save space in production. About Plasmait GmbH: Plasmait is a supplier of heat and surface treatment solutions for wire, cable, tube, strip and ribbon industry. Plasmait’s solutions are based on a patented plasma treatment process that offers advances in production efficiency, surface quality, process control and ecology. Plasmait provides heat and surface treatment solutions as individual machines or as turn-key production line deployments. This entry was posted in Plasmait News by igor. Bookmark the permalink.